Contests and the winners ! A couple of weeks ago we announced some contests for our guildmembers. In these they could earn the undying respect and honour of their peers, but even more importantly: Gold! With the summer slack in full force everyone had the time to enter the competitions and enjoy other people's entries. There were quite a few different categories in which to participate. In the next part we will list the categories and their winners. In all categories the winner gets 1000 gold, the first runner-up gets 500 and the second gets 250. Contest 1: Design a new tabard This contest was won by Laydown. We will all be wearing his creation for the foreseeable future. In his own words he describes the tabard as follows: I believe this is the best tabard there is right now; the reason why I believe that is because it is not only diffrent from many other tabards, but also a refreshing colour. Yellow and black goes very well hand in hand, espcially in these summer months. The tabard is bulletproofed it suits all classes well with their gear as you can see. The two runners-up are Sedona (2nd) and Lilien (3rd). Contest 2: Banner contest The site could use a new banner and Erinak went out and created one for us. He used the Wipus Frequentus recurring theme as the main object of his banner. The two runners up are Anduin (2nd) and again Anduin with a different banner (2nd). Contest 3: a PVP/PVE screenshot This contest was won by someone that made a trip back to memory lane and went and slaughtered alliance in Stranglethorn Vale. Congratulations Mack on your victory. The two runners up are Lilien (2nd) and Supervegeta (3rd). Contest 4: a funny Screenshot In this category we have a shared winner, Baax and Supervegeta both have the same amount of votes and will both take home the share sum of 1500 gold for their efforts. Contest 5: a scenic Screenshot We asked for people to make some screenshots of the nicest places in the WoW universe, and they did. The winner in this competition is Zorrander. The two runners up are Sedona and Mack, they will share the total amount of 750 gold. Contest 6: the "no-rules" Screenshot This contest was won by Dark(something). He was so sad that he never won grouhls wang during a raid that he made his own. The two runners-up will once again be sharing, Sedona and Zahriel will each get half of 750 gold. Contest 7: Movie contest Of course no contest would be complete without a movie contest. This one was won by Erinak with his version of the guild's history in the Burning Crusade. The two runners up are: Laydown (2nd) and Zorrander (3rd). Contest 8: Epic feats In this contest we asked for people to describe something really epic which they had accomplished with their character. 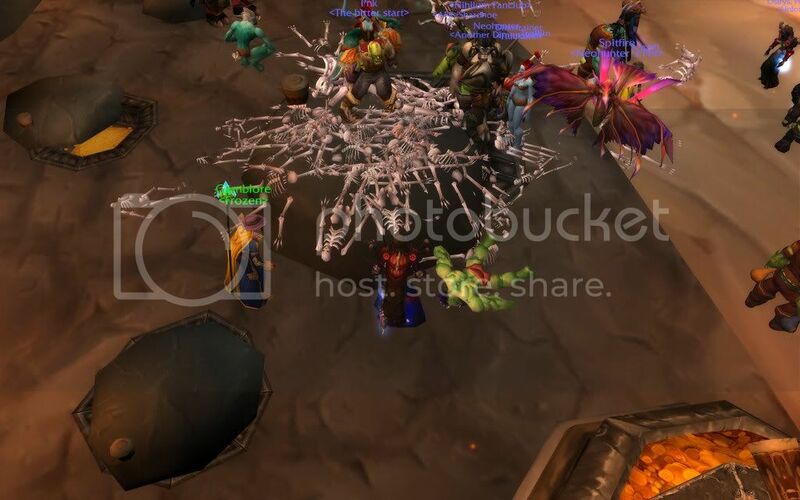 In the end everyone agreed that hellfiend had been the most epic by killing of l1's of nihilums fanclub in orgrimmar. The runners-up are Hammerhorn (2nd) and Kaeln (3rd). The runners-up are Strangepork (2nd) and Hammerhorn (3rd).